Nikon Force XR scopes are ideal for pistol mounting and these tough scopes are capable of handling the recoil of modern handgun hunting cartridges. 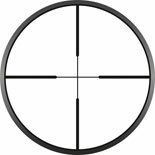 Force XR Scopes feature extended eye relief that allows the scopes to be safely used on even heavy recoiling revolvers like the .44 Magnum. Force XR handgun scopes feature hand-turn adjustments and a quick focus eyepiece that allows for fast adjustments when out in the field. While Force XR scopes excel when paired with handguns, these riflescopes also work well with scout style rifles due to the extended eye relief and recoil resistance (we recommend using the Nikonplex Model when installing on a scout rifle). Handgun hunting ain’t easy, so give yourself the superior advantage with a Nikon Force XR scope.